I also have a V1 N1 1883 edition. 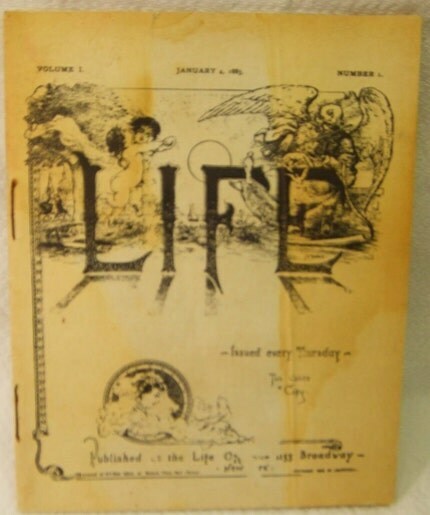 Dear Friends,I also have a copy of this LIFE booklet that I inherited. Would you please be kind enough to share the sale price so that I can value and insure my accordingly? Thank you… Your website is superb! My daughter recently bought one of these LIFE booklets at a yard sale. Can you tell me how to verify that it was published in 1883 and not a reprint that was published later as I read on another site? I also have Volume 1 Number 1 January 4, 1883. Original staples are also included. Wisdom Let Loose. If all flesh is grass, was Adam the fodder of mankind? As the donkey told it Page 12.